The elderly, widows, abandoned, terminally ill and other marginalized women are most vulnerable to suffering because of social exclusion and domestic violence. The senior citizens particularly, shunned or abandoned by their families, face the prospect of a lonely life and even death. In such scenarios, apart from providing rehabilitation, counselling, training, financial assistance and health-care activities, SARVAM (the Integral Rural Development Programme of Sri Aurobindo Society) extends an almost family presence, with the volunteers and coordinators ensuring constant attention and caring gestures towards such elderly people. In addition, SARVAM coordinators and volunteers organize special events for them to be happy, healthy, cheerful and participative. They are made aware of the need to be supportive to each other without discrimination of age, caste, race, language, religion and status. 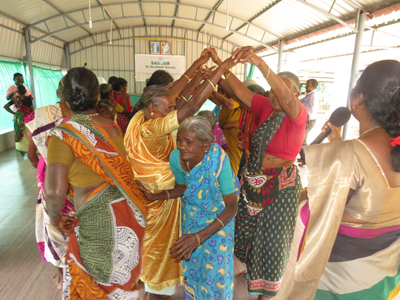 Recently, SARVAM organized a event for the elderly women belonging to various project villages to commemorate the International Women’s Day. This programme took place on February 23, 2019, which included some traditional games played in earlier times, food, fun and frolic. 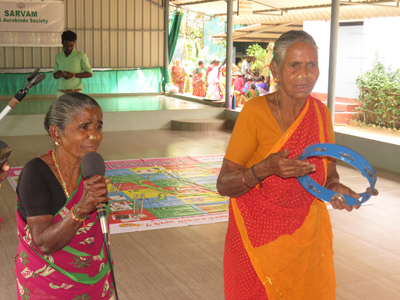 More than 100 women between the ages of 40 to 85 participated in many games. The main objective of this programme was to provide an outlet and to bring them joy and dignity of playing in a carefree manner, bringing them memories of the years when they were growing up. 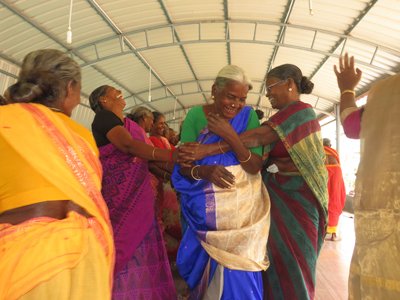 Playing these familiar games also brought the women together, encouraging teamwork and social interaction. Junior Chamber International (JCI) is an international leadership training organization, which consists of members who are young active citizens based in different parts of the world. They work towards the betterment and sustainability of the communities in which they live. They participated in coordinating this programme.